Millions, if not billions, of folks are unaware of the fact that Sal Cataldi has forged a presence in their collective and individual conscious by way of his decidedly eccentric career at the helm of Cataldi Public Relations wherein he and his staff have shaped several award winning guerilla marketing campaigns that defy convention. We have all journeyed to the center of Sal's mind by way of television, radio, print, social, and digital media. It's the stuff of pop culture that we the people of New York City continually debate, embrace, are fascinated by, oft imitate, and sometimes reject, but never forget. Yet Sal's laudable media career is, to my ears, interchangeable with his watershed canon as a multi-instrumentalist, recording artist, composer, producer, performer, and conceptual artist. His works on stage and in the studio with The Hari Karaoke Trio of Doom - which Sal describes as an "industrial/ambient jazz dub extravaganza" with drummer Doug Hitchcock and fretless bass virtuoso Percy Jones of Brand X and Eno renown; along with avant-jazz Afro-funk collective Collector, Brooklyn comedy rockers Frank's Museum; The Trachtenberg Family Slideshow Players; and in the guitar orchestra of pioneering No Wave minimalist Rhys Chatham on his A Crimson Grail - Live at Lincoln Center (Nonesuch Records, 2011) collection, among other projects, are all worthy of exploration. When Manhattanites of a certain ilk carp o'er a New York City music scene which they claim has died and gone to Brooklyn, they should follow Sal Cataldi around. And he gigs in Brooklyn as well; so you have been warned! Mr. Cataldi's his latest endeavor arrives under the banner of Spaghetti Eastern Music, a moniker inspired by his reverence of conductor, orchestrator, and iconic macaroni flick soundtrack composer Ennio Morricone coupled with his modus operandi of "noodling and creating an environment where the guitar could do all the talking." Sal's Spaghetti Eastern Music album, with both instrumental and vocal tracks, is aptly titled Sketches of Spam - a phrase which derives from his fandom of Miles Davis and Gil Evans, Eric Idle, and Frank Zappa. "I am a huge fan of that kind of lush environmental music, proto-ambient, if you will. Funny thing is I had this title floating in my head for ten years before I made the album. And in that time, 'spam' means something completely different now to many people - junk mail vs. canned meat that soldiers ate in World War II." Though Sketches of Spam is a genre traversing song-cycle which simultaneously embraces and deconstructs folk, jazz, fusion, ambient, drum 'n' bass, metal, funk, punk, blues, and every permutation thereof - and many of which have yet to be tagged - Cataldi's diverse compositions hang together as a collection, which is a rare feat in any generation of modern recorded music. 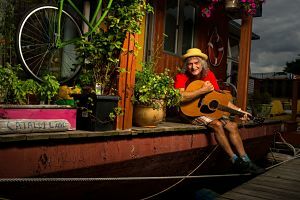 Sal's alternative guitar tuning rendition of John Lennon's "Ticket to Ride," replete with harmonic overtones and a restated melody which floats over the bar-line quotes Delta blues with a tinge of Bob Dylan's "Sad Eyed Lady of the Lowlands." Fusion fanatics, myself included, will revel in the revved up "Slaka's Sambo Sox" which Sal reveals to be founded upon "frenetic stop-time beats ala Alan Foster on Miles' Agharta meeting a drone/mantra and serpentine fuzz guitar from the early Mahavishnu school." Guitar players note that Cataldi actually pulls off John McLaughlin's proclivity for playing in and out of time on that track. Some of Sal's Spam servings are also complimented by YouTube videos. Among those that struck me as essential include the visuals for "Slaka's Sambo Sox" which juxtaposes ravenous varmints, competitive gluttons, and ravishing gridiron side-line entertainers. "It's visual Dada, sublimely, watchable ridiculousness!" proclaims Sal. "Making a video, I just find images that match the mood. This is the great Coney Island hot dog eater Kobayashi battling a hamster in an eating contest, then you have speeded-up cheerleaders and, my favorite, a video of a dryer basically whirling with a brick inside until it falls apart. It's really eye-candy, bizarre sweets, to make the listening experience fun." "NY Expats/Henry Miller Says" melds a spoken word diatribe from the iconic American writer as captured by writer/director Tom Schiller which resonates rather profoundly in the present day. Sal emphasizes, "well, like a lot of gents in their early 20s, I got seriously into Henry Miller, just as I was about to join society. After I had recorded the backing track, the atmosphere, I went looking for something to add to it. This rant by Miller comes from a documentary where he is talking, well, actually 'bitching' about his days in New York as he walks about the 'Old New York' movie sets in a Hollywood studio. When I laid it in, I realized it seemed to be the perfect statement about New York today; how inflated real estate is making a life making art impossible, how so many old institutions are falling by the wayside. I mean, the man is long dead and still making a lot of sense to me!" Longtime collaborator and Grammy Award winning engineer Bob Stander renders electric bass passages which slice through Cataldi's bleeps, blips, boinks and wayward guitar motifs on the opening cut "Downtown Uptight," another track abetted by visuals which fuse vintage 1960s discotheque images from the Whiskey A Go-Go and German television which synch perfectly with Stander's Motown grooves. Much of Spam was waxed aboard Cataldi's floating residence known as The Houseboat Garlic Knot which is anchored somewhere "in the waters off the Big Apple." "In general, living on top of the water definitely has an impact on a person. It creates a chill and an ambiance, there are lots of interesting noises at night, seabirds, the squealing of the dock lines and docks, the sound of sail lines gently beating on masts. I think there's a romanticism and Zen vibe that has certainly found its way into the music. 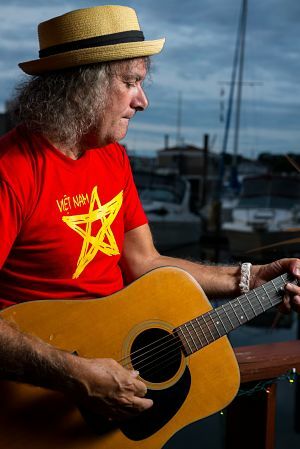 The experiences... the diversity, I think what I learned about music, improvising, writing songs, creating environments and presenting a show have all come to fore in this album." Sal the confessional troubadour materializes in "Momma Called," "A Girl Like You," and "Wild One" a trio of shoegazing offerings which could have wooed Carly Simon from Cat Stevens all those years ago. We'll never know. But at least we have Sketches of Spam. 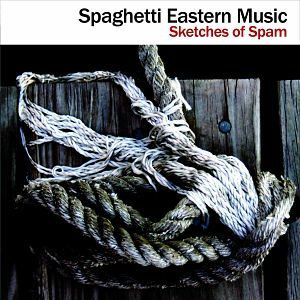 Sketches of Spam by Spaghetti Eastern Music out now and available via CD Baby, iTunes, Amazon, Spotify, and Rhapsody. Sal Cataldi is live and in concert on Wednesday, October 7, 2015 at midnight at Rockwood Music Hall, 196 Allen Street, New York City; and Friday, October 16, 2015 at 8:00 PM at the KGB Bar Red Room Lounge with dancer Callista Zaki and poet William Lessard, 85 East 4th Street .